The Senior Ministry at Beachside Baptist Church is very active. In addition to our monthly fellowship meetings/meals, we are also involved in a special ministry – CAREGIVER SUPPORT TEAM… Available to make visits to church family members at local facilities, either residing there as residents or for temporary Rehab. The caregiver support team also is available to coordinate meal carry-in for those church family members experiencing recent hospitalizations, hardships, or crisis. If interested in being a part of our team, or know of church members who would benefit from a visit, please contact Lynn or Christie, Co Chrm. (info in Directory). Once a month* our Seniors get together and fellowship with one another. 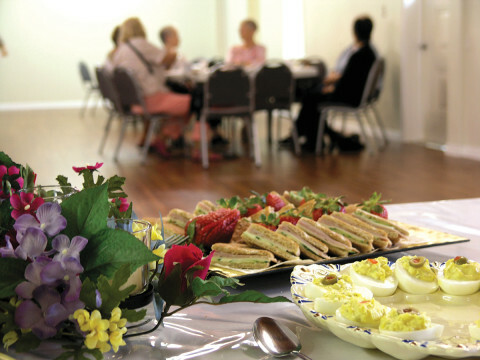 A meal is provided by members, and a guest speaker presents information relevant for Seniors. You do not need to be a member of Beachside Baptist Church to participate. Anyone 55+ is welcome, and if you have a guest or friend that is younger, they are welcomed too. Please note, however, there is no childcare or nursery available during our regularly scheduled meetings. These events are normally scheduled for the last Thursday of the month beginning at 11:30 a.m. See our event calendar for the next scheduled Senior Fellowship program. If you have any questions, please contact Christie or Lynn. Their contact information is available in the members directory. *Check calendar for event – dates, time and location are subject to change.